If you'd like to compare your numbers between Seller Central and InventoryLab, you'll need to follow the below steps. 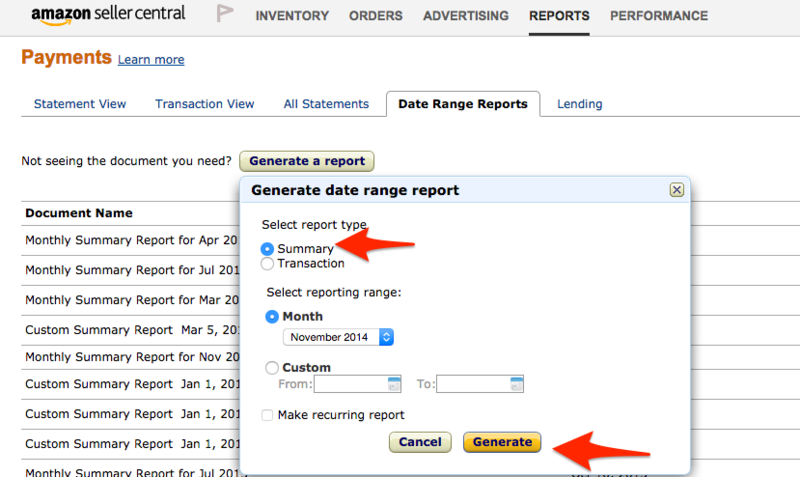 First, log in to Seller Central and visit Reports>Payments>Date Range Reports. You will want to run a summary report for any given month or timeframe where the reports are completely reconciled in InventoryLab. Once you generate the report, you need to download the PDF file and open it. You only need to be concerned with finding your gross profit, so there are only 3 totals to be concerned with in terms of reconciling your InventoryLab numbers from this report. You will want to take the Income Total – Expenses to determine your gross profit for any given month. You will not factor in other expenses, such as Cost of Goods Sold, Office Supplies, Rent, etc. to this equation. A good rule of thumb is to not concern yourself with total profit reports for any given current month until all of your sales for that month show as reconciled. Once a month is fully reconciled, your net profit should be final for that month and should not change beyond that point. You will also need to make sure all of your data is synced. As a paid subscriber, you are able to request your sales and expense data be synced to your InventoryLab account at no extra cost. For instructions on how to do this, please visit Importing Historical Sale and Expense Data.